When times are tough, one of the hardest things to do is stay positive. But being positive is important for every aspect of our lives. It improves our health. It improves our outlook on work and family. And it makes us more pleasant to be around. I am an optimist, but I’ve been feeling this slump like everyone else. As an entrepreneur, I feel a little bit like I have a split personality, reminding myself of all the reasons that starting a company during a recession is a good idea, internalizing all the reasons that owning a business in a recession is a very difficult prospect. It’s emotionally draining. But the optimist in me has been fighting to the top. So instead of dwelling on the bad, I came up with this list of 10 ways to stay positive, even when times are tough. Here are the first three tips; I’ll be posting the rest throughout the week. 1) Spend time doing something that makes you happy. What do you love to do? What is something that makes you happy just because you like doing it so much? Anything that has an ulterior motive attached doesn’t count. For example, I am happy when I go jogging because I know that it will help me get in shape, but I don’t really like jogging, and I wouldn’t do it if it didn’t have positive health benefits. I usually would cite playing basketball as something that I love doing just for the sake of it. When I play, I get to hang out with friends, be competitive, exercise, and be social. It also takes my mind off everything else. A couple of weeks ago, however, I got an even better example to use. My brother Matt and his wife Michele had their first daughter – my first niece – Willow. The only way that I can describe her birth is complete joy. Focusing my attention on her and my family is something that helps keep me optimistic and positive in a way that few other things ever have. Figure out what it is that you love, and spend some time doing it. 2) Vote! Living in the United States, the election is top of mind for me and most other Americans today. Being part of a larger movement of people who are all doing the same thing on the same day is empowering and gives you a sense of belonging. Today, a record number of voters are heading to the polls, and we will end the day with either a black President-elect or a woman Vice President-elect. History will be made either way. 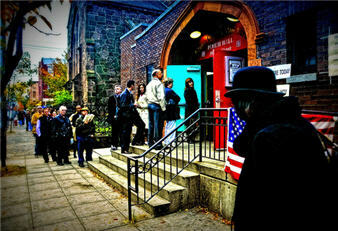 Get out to the polls and you’ll feel the energy and optimism there that is inherent in the voting process. Voting will give you a sense of optimism and hope for the future. 3) Volunteer. There are always opportunities to help people, especially in a time of economic uncertainty. There are volunteer opportunities for every personality type and skill level. My sister-in-law has donated her time to helping non-profits put together professional business plans. A co-worker is part of the Big Brothers Big Sisters program. A friend and his family have donated their time in helping to raise Great Danes that are used for rehabilitation. Not only does helping others help you feel better about yourself, but it also reminds you to look outside yourself to put the needs of others first. Up tomorrow on 16thLetter – reasons 4-6 to stay positive when times are tough. What are you starting and what will you leave behind? This entry was posted on Tuesday, November 4th, 2008 at 1:35 pm	and is filed under Internet entrepreneurs, Management, Play, Pure Incubation. You can follow any responses to this entry through the RSS 2.0 feed. Both comments and pings are currently closed. Running is my “love it for the sake of loving it” right now. Although, it wasn’t always that way. Willow is a great name…. Congrats on the new (first) niece! “Amateurs built the Ark, Professional’s built the Titanic!” Think about it…. Just thought I would share that little inspiration.